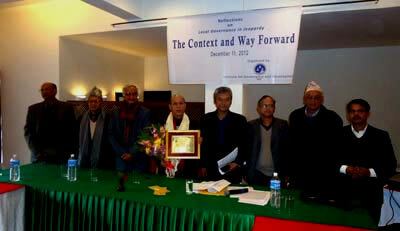 Mr Kedar Khadka, President of GoGo Foundation, has been awarded with Good Governance Promotion Prize amidst a program in Kathmandu on 11 December 2012. Institute of Governance and Development awarded Mr Khadka for his two decades of untiring efforts, personal courage and genuineness of commitment to promote good governance and defend public interest with exceptional degree of grace, grit and determination in Nepal. The award carries a purse of Rs 12,000 and a letter of appreciation. Dr Shyam Bhurtel, decentralized governance expert, also donated Rs 5,000 to GoGo Foundation which has also decided to confer GoGo Foundation Award annually to the promoters and contributors of good governance in Nepal from among journalists, civil society activists and government officials.